BobbieJo a nice level doe. BobbieJo has very good dairy character, nice topline. She has a nice high, wide rear udder attachment with a long, smooth fore udder attachment making her udder a nice global shape with nicely sized and placed teats. 2017 Breeding: Bobbie had an exciting breeding this year! Thanks to Renegade Farm for allowing us to breed her to their buck CH Sartyr Eclipse Tyrone *B EX90 VEE! 2012 Spotlight sale buck, son of the 2012 ADGA Saanen National Champion SGCH Sartyr Kojack Trevi 7*M EX93 EEEE. Pearl is a nicely balanced doe, with a nice udder to boot! She s easy to milk and milks a lot! Escape, or "fuzzy" as Brad has come to call her is a beautiful doe! long, level and dairy. :) She has a nice, wide open escution to boot! She freshener in 2014 with a beautiful wide rear udder and nice fore. She has nicely placed and shaped feats. Due to an injury she didn't settle for a 2015 breeding but we are hoping she settled for the 2016 breeding season! Cocoa was an awesome "first addition" to our Nigerian herd! She has had several 1st place, 1 2nd and a Jr. Champion under her belt before she even came to our farm! (unfortunately the Jr. Champion wasn't an official leg.. :( )! 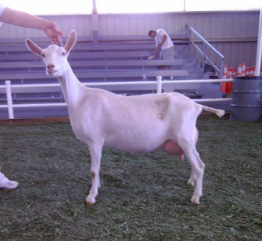 Cocoa is a nice, level, deep bodied doe, nice tight toes, and really she is a very dairy goat! Doesn't look like it in this picture, but she does have good dairy character! She freshened with an awesome udder for her 1st and 2nd freshening. Tightly attached rear, could use some length in her fore udder though.